Food Processing | Texas Alloys & Tool Co.
Don’t let corrosion and contamination keep your facility from bringing food to tables with the experts at Texas Alloys & Tool Co.
We offer complete stainless steel, aluminum and carbon alloy product distribution services to the Texas food processing industry from our Forth Worth facility, which enables our team to meet the tightest deadlines while maintaining the utmost quality. Stainless steel is considered a superior material for food processing equipment globally. Most regulations require food-processing equipment that is easily cleanable, corrosion resistant and with smoothly bonded seams, and stainless steel offers the highest level of compliance to those requirements. Stainless steel has a proven track record in any area where sanitation and ease of cleaning are important, including the food manufacturing industry. The metal has no pores or cracks, which reduces dirt, grime and bacteria buildup. The metal’s ability to be cleaned easily also allows manufacturers to avoid flavor and odor transfer from batch to batch. 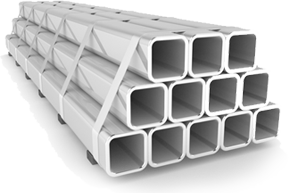 Texas Alloys & Tool Co. offers a wide array of stainless steel products to meet your facility’s needs, including tube, pipe and fittings, round bar, flat bar, square bar, hex tube, angle, channel, beam, sheet, plate and diamond tread plate. Common grades include 304 and 316 stainless steels. Getting materials that meet your quality standards to your facility on time is our top priority. By managing our own fleet of trucks, Texas Alloys is able to make sure that your industrial stainless steel, carbon alloy and aluminum delivery is there when you need it. Our drivers and material handlers are trained to minimize risks of damage, which is common with motor-freight and third-party trucking companies. We offer weekly delivery routes to much of north, central and west Texas, which enables customers to focus on their work without worry of missed materials shipments. Having our own fleet enables us to offer short-notice delivery and off-schedule day carriage. Receive materials at your facility within one week when you order today. Our stainless steel products are extremely popular with food processing customers.